The ironic thing about this post is that my second post ever was about running. How much I loved it, how much more than just moving my feet it meant to me, and how it was instrumental in my recovery process. Sidenote: If you get distracted by early posts after clicking on that one, I apologize in advance for the horrendous photography and formatting issues. Oh man, they’re great. Today’s post is the opposite, as I haven’t been on an exclusive run since I did the Magnificent Mile Women’s Half last year. There’s always short bursts of running incorporated into my current workouts, but I haven’t done a forget-it-all, zone-out, long run in months. Running and I are on a break. In reflecting on my relationship with running, I realized that it’s just something I don’t need right now. This post was originally going to be about when fitness goals change, but as I started writing, I realized that it was more than just that. At every point in your life, certain actions or behaviors will be necessary or important to help you survive. They may not all be positive, but they’re vital for your existence at that moment. As you continue to grow and change as a person, it’s up to you to decide what characteristics or behaviors you may or may not need to be the best version of yourself. Self-discovery is a fluid, ever-changing process that requires continual evaluation as you go along. During my active addiction, I needed drugs and alcohol to help me deal with emotions and fear. Without them, I would have completely broken down and been unable to function under the stress that I put myself under. I needed denial for a period of time because I wasn’t ready to accept that my life was spiraling out of control and I was hurting those around me. I needed to believe that everything was going to work out when I was sentenced to jail or else I wouldn’t have been able to get through that time. There have been a lot of changes and ups and downs for me the past few years. I’ve struggled to get back on my feet after hitting bottom, I’ve had to learn how to be in a relationship with another person while we both simultaneously discover who we are as individuals, and I moved halfway across the country and far from family and friends. For me, what I needed in my life during those years was running. Running as a positive and running as a negative. You may remember the time when I began to abuse running the same way I abused drugs — to change the way I felt and exert some semblance of control over my life. Without that period, I never would have seen how addiction can manifest itself in any variety of behaviors and I could have become complacent in my recovery. Last year was especially tough on me. My marriage almost ended, I was in the process of starting a totally new career, and I was officially diagnosed with depression. I also ran three half marathons in that time, two of which I was less than prepared for. Although I don’t always listen to it, I have a pretty strong sense of intuition. I always felt a pull to run when I did it and I would come back feeling accomplished and more serene. After my last half, I didn’t feel that pull anymore. I’ve learned over time that my body tends to know what’s best for it and all I really need to do is listen. Right now I feel the same pull towards HIIT and strength workouts as used to with running. So while I may not be running now, there could always come a time when that shift comes and I need those runs again in my life. Until then, I’ve got some weights to lift. Big ups to Amanda for letting me think out loud. AND FOR GETTING A COOKBOOK DEAL! What behaviors or characteristics no longer fit your current life? Totally understand. I also think that we go through phases in our lives when what we need in general changes. Like you and your macaroni and cheese–you were at Dimo’s every weekend, and now you are branching out. At least to putting the mac on burgers, but it’s a start. ;D When our lives are out of control, we look for the one thing that is in our power to control–for you, that was running. I think for me, it was the horses at times. The difference was, I really was crazy about them, but there were times when that is how I survived. MMM Mac and cheese. Aw I love you and your horses. Makes complete sense! We all go through phases in life and at different times need different things. I’m with you on the weights girl! I think I need running at least once a week to stay normal, haha! Though I do have times (like right now) when I don’t totally love it and would rather be strength training. I find though after about 4 months I get antsy and want to race again! I totally get it. I’m glad you’ve found what works for you!! The one thing I’ve noticed from reading your blog is that you do a really good job of acknowledging what is happening/changing in your life. I love that about this space and I appreciate how open you are with all of us. I couldn’t agree more! Running and I go through waves…when it fits my lifestyle and when it doesn’t. As long as I’m active doing SOMETHING, I consider it a win! 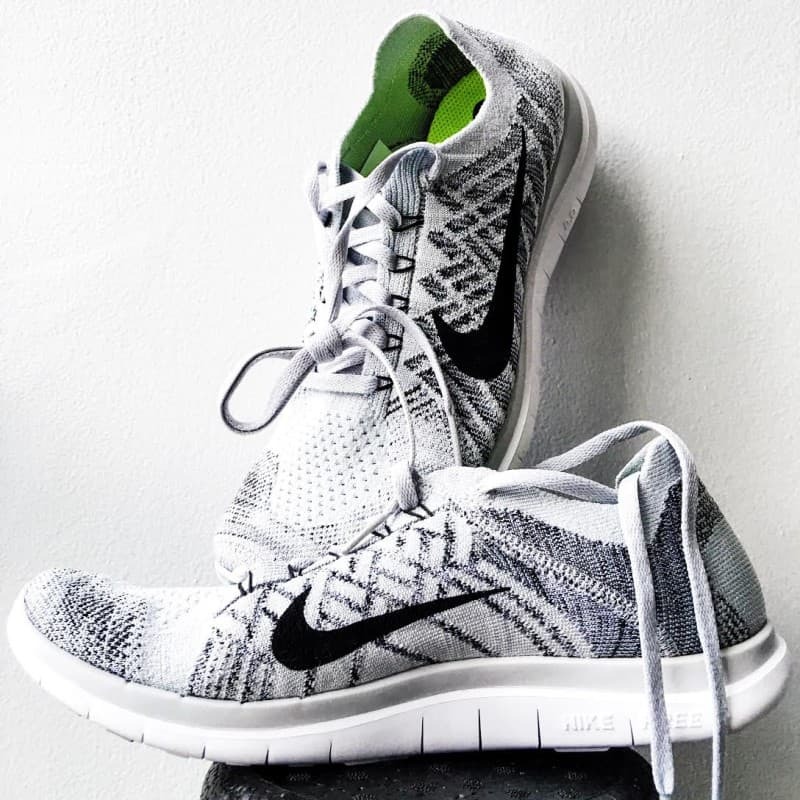 By the way, I have those same Nike Free Flyknit shoes…don’t you love them?! I do! They’re not the best for longer sprints I’ve found, but they’re so great for everything else! Totally agree on how we go through phases throughout life in terms of what we need to make it through. Running has pretty much always been a constant for me but a few years ago I was going through some really tough times and I signed up for ALL the races! It was like I needed all that training and all those finishes to make me feel whole again somehow? Now I’m back to just going for a run once or twice a week (or sometimes not at all!) to clear my head. From reading your blog I can tell you are a pretty intuitive person and always seem to know what you need at the time! Haha that sounds like me last year. It was tough but it was what I needed at the time. Thanks so much for reading Jill! I understand being on a break with running. It’s SO good to get away and come back sometime and remember why I loved it. I’m thankful that God so graciously gave us different ways to move our bodies. I feel like I’ll feel that way if/when I get back to it. Stopping by from TOLT. I can definitely relate to this. While I still need running in my life, it’s not all I need. I’ve added in other things & cut back on the running. Weight lifting was one of the things I was really drawn to when I cut back on running. The feeling it provides me of being strong & capable is really something. Hey Jesse! Yeah, I have my running in the form of shorter, faster sprints, which I love. I just can’t do the distances anymore. I go through phases like this too. Glad you’re listening to yourself! Sometimes thats the best thing we can do! Amazing post! The balance of things in our lives is such a delicate thing. I always find it amazing how we develop such unhealthy relationships with healthy activities. I find myself in the same situation with running, and it’s only at times of rest, recovery, or injury that I realize its hold on me. I love running and love training, but it definitely comes at a cost in some facets of my life. Your post comes at a great moment for me because I was needing some additional insight that I wasn’t finding in myself. With a 100k just 5 weeks away and nursing strain ligaments and muscles, I am finally sitting well with the fact that the break was/is needed. I come from a life that reveled in excess when I was younger, so I appreciate these moments when I am shown that I still tiptoe on this fine line with the occasional disregard of the line entirely. It centers me and ignites the mindfulness that I work on every day. Thank you for sharing and offering incredible insight! I love this comment and your honesty. Sometimes it’s ok to take that step back when you need it and it takes hearing from someone else that you can do it. Love this. Our lives are filled with so many little cycles and it’s crucial to embrace the change and let go of what doesn’t serve us. It can be tough – especially when things like running, how we eat, etc are so intertwined into the identity we’ve created for ourselves. I go through phases where I’m into some activities more than others. Variety is the spice of life! Exactly! Sounds like you have a great outlook on things! I love your thoughts here! I know that I go through phases in life where I feel a strong pull to something. I do think it’s best to honor your body in those situations. Thanks heather! It’s always important to listen and do what’s best for you. I think I’ve reached a very similar spot. I enjoy running, but I don’t NEED it anymore. Three years ago I NEEDED running to get through my divorce and process the anxiety related to it. Now, I’m happy with a 30 minute run and a BodyPump class. I don’t feel the draw to train for a marathon at the moment. Right? I know it when I feel it and it’s just not there right now. Plus you need to get yoself fixed up! That’s a very interesting and new perspective to look at running – and i’m glad you shared that with us! I used to get up 4-5 days a week at 6 am to run when I played rugby. I thought I needed it to stay in shape, to stay lean, and to be conditioned. I started HATING running because of it, which was kind of depressing for me because i thought i needed it so badly. Slowly I started cutting it out and now only go once a week usually. I enjoy it so much more! I hope that you find your perfect balance with running and keep loving HIIT! Our bodies know ourselves better than our minds do sometimes. Too much of a good thing can end up being a bad thing. I can see why you started hating it! I’m so glad you’ve found what works for you. And you are killin it girl! Too much of a good thing can sometimes have the opposite effect. I can see why you started hating it! Glad you’ve found what works for you. And you are killin it girl! I can totally relate to this. I used to run almost everyday of the week thinking that’s how I was getting the best workout. But once I started doing more with weights I noticed significant changes in my body. I do however still love going for a run when I need to clear my head or jogging and talking with a friend. Those are the best kinds of runs. They were always great for getting outside myself and like a form of meditation! I’ve never really thought about how much I need running to clear my mind, relieve stress, and help me through hard days. I always come back from a run feeling like my issue isn’t/wasn’t so bad, and I have a new perspective. Totally get that people don’t feel the same about running as they used to. For me, the longer I go without running, the less I seem to miss it. Thanks for sharing your thoughts! Yeah, running was always a great way for me to get out and process things that were going on in my life. Thanks for reading Kerri! I’ve never reached the point you have with running, but I get where you are coming from. It’s easy to over do running and if it isn’t working for you then you should step away from it. Exercise routines should be stress releasers not stress enablers. When your current routine becomes the latter it’s time to find another activity or take break. It’s cool to step back and evaluate where we currently are, and if we still need (or “need”) things that we used to do. I tried – in a half-assed manner – to love running. It seems like the blogging community is filled with people who love to run, and I used to WANT to love it. Buuuut, I don’t. I like the occasional 2-3 mile run that gets me outside in the fresh air, esp. if it’s nice outside, but I don’t need it to feel healthy and strong. …I’m a gym rat tehehe. Me too I’m realizing. Running and I had a good run (ha) but right now I’ll be in the gym!